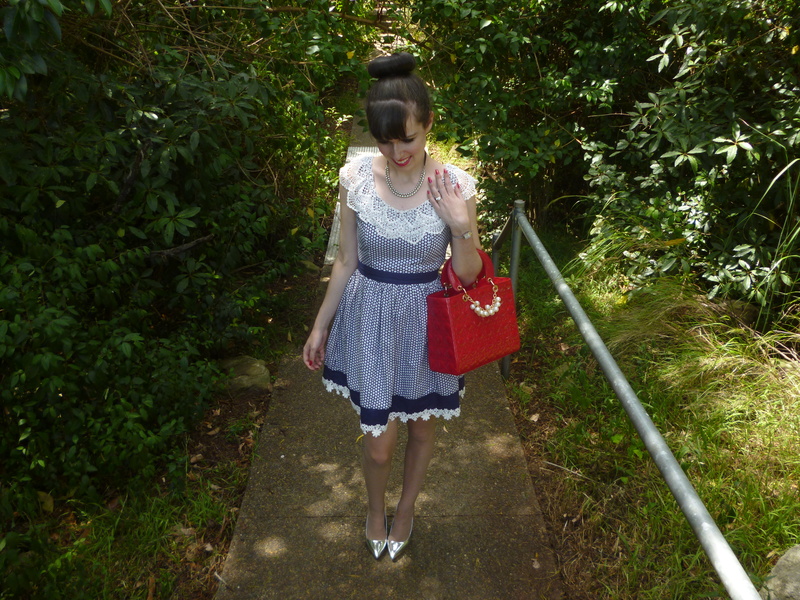 Back in 2009 when I first discovered both Modcloth and the concept of fashion blogging, I instantly fell in love with a Modcloth piece called the Keiko Lynn dress. 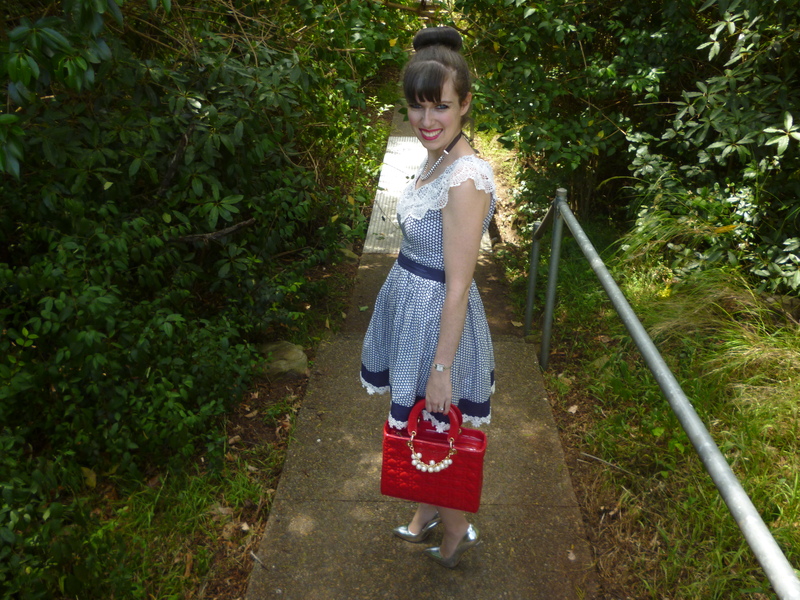 I eventually purchased it in my first ever order from Modcloth and got an incredible amount of use from it. This was truly the best dress! I was so sad when, a couple of years later, the elasticated waist and sleeves became so loose that I couldn’t wear it anymore. 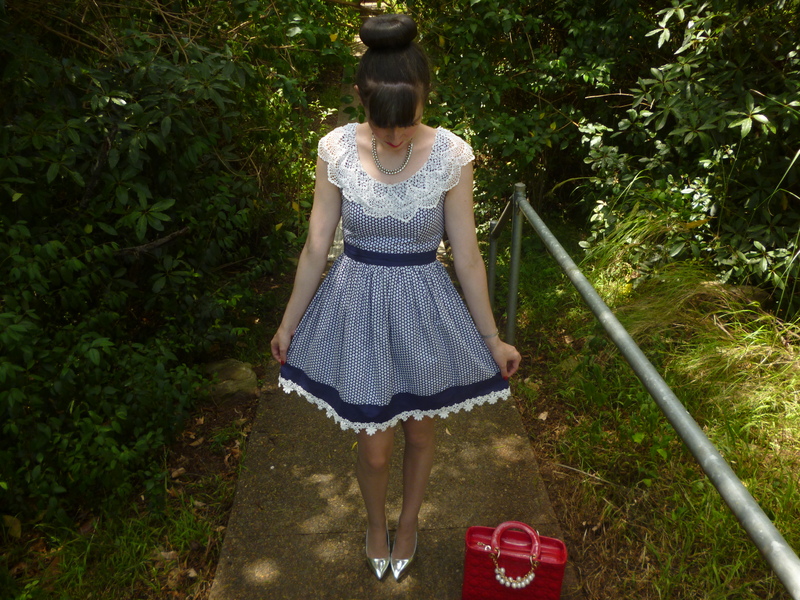 Last year I noticed The Blueberry Muffin dress on the Modcloth website and it was so very similar to the Keiko Lynn dress that I missed so dearly; the same lace detailing and trim, identical colour scheme, similar polka dot design and analogous shape. I knew I had to have it! I was very good and waited until the 50% off sale. When I finally received this dress it was amazing. It was everything I’d loved about the Keiko Lynn dress and better. The zip instead of elastic is much more practical and I like the material more than the silk. The polka dots are much bigger on this dress so it seems more like a white rather than navy blue piece which I don’t mind. 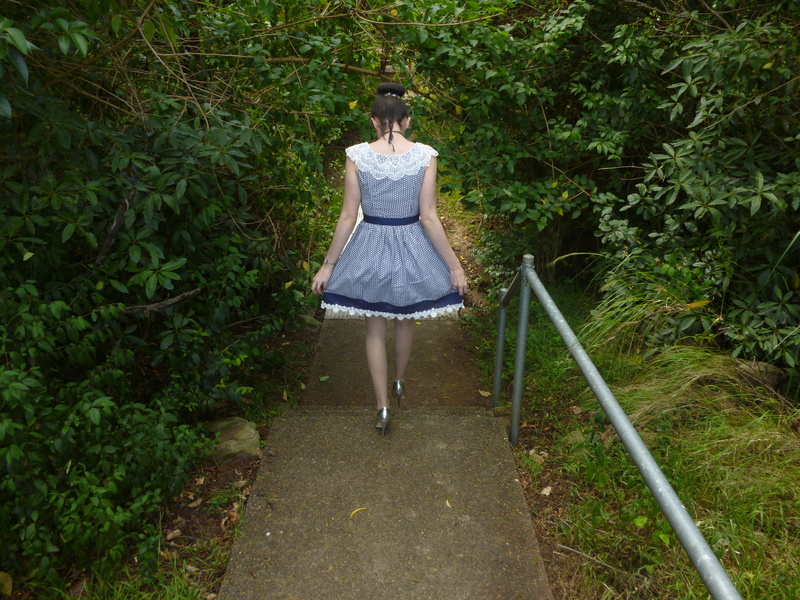 I’m so happy to have this dress and I expect to get just as much use from it as I did with the Keiko Lynn dress. My shoes are another item I’d had my eye on for ages. I’ve been obsessed with silver shoes for quite some time now but could never find the right pair. 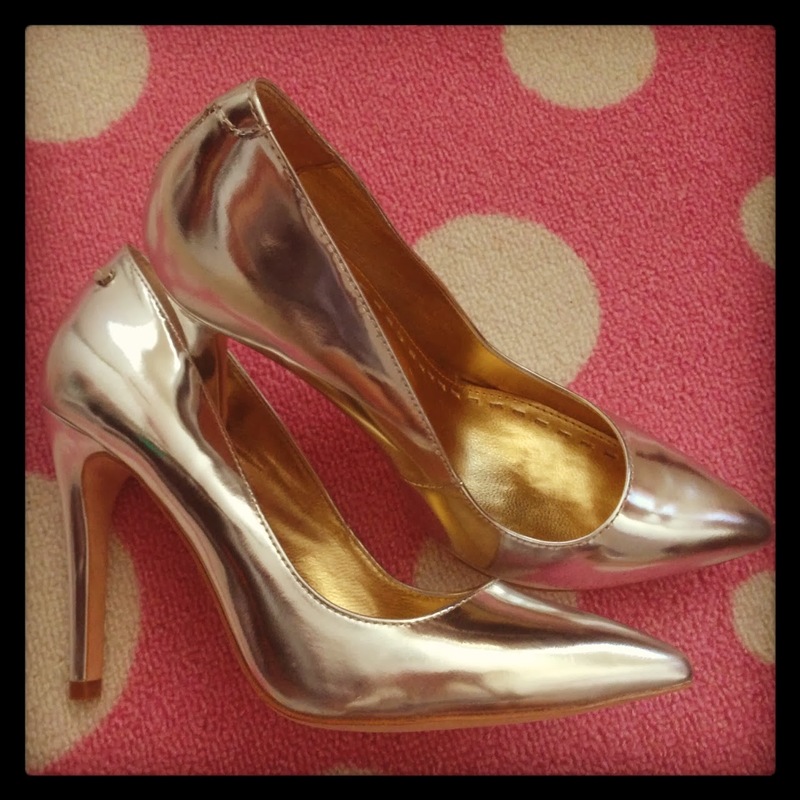 I loved this pair, the First Kiss Heels from Mimco but they were rather pricey. I considered buying them anyway but simply just couldn’t justify it. So I waited and eventually they became mine for a wonderful 60% off. It’s my first ever piece from Mimco, how exciting. It’s so cool how the shoes are silver on the outside and gold on the inside. They are fantastic quality and I absolutely love wearing them. I’m often surprised by how many comments, both in the blog and non blog world, I get about my hair and why I always have it in the same style. The photos from my last post with my hair down were quite awhile ago when my hair wasn’t so thin and flat. I thought about cutting my hair back into that style but I realised it would just take too much time and stress me out each day. My hair is not naturally straight. I can only imagine how stressed I’d be at 6.30am rushing to straighten my hair. I love it how my current style takes less than 10 minutes and I don’t have to fix it throughout the day. I simply don’t feel comfortable with my hair in any other way. I felt liberated when I discovered this hairstyle; no more stress! This entry was posted in Mimco, Modcloth, Outfits, Uncategorized. Bookmark the permalink. Wow! I love your outfit, especially the beautiful red bag! Imogen – you are positively elegant and gorgeous in the dress! i hadn't seen this dress and it is so feminine and fun! You are looking so adorable…..you pick out dresses like this that enhance your figure!!! Love the beautiful Dress 🙂 ,you look amazing! The dress is lovely, but I love those shoes! Love those silver shoes on you, so pretty! those buns are the greatest!! you look stunning! Oooh what a a lovely dress. You look amazing. Your heels are sosososo pretty! Perfect eye-catchers! 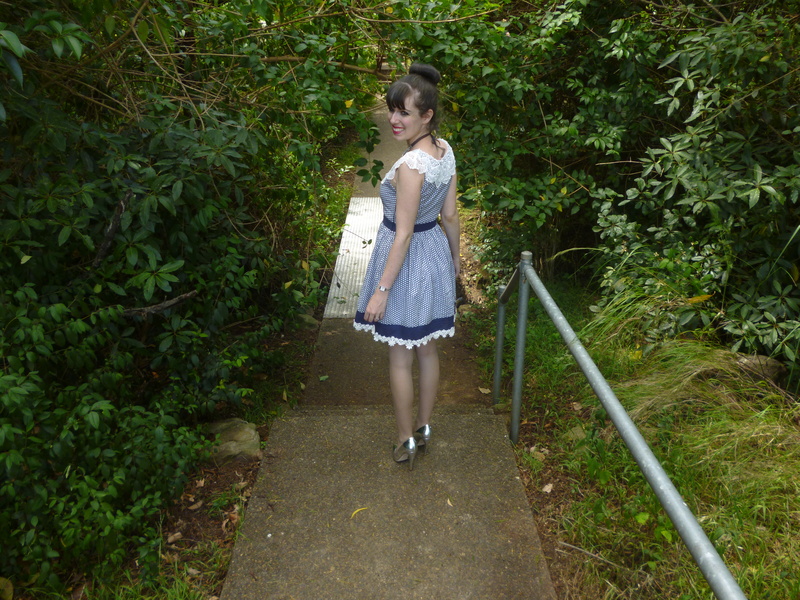 Oh i totally remember that Keiko Lynn dress on the Modcloth site… it seems to be yesterday, yet it was years ago! I like your look today. Such a fun dress! I'm loving the lace detailing. You look absolutely stunning! <3 The details on the dress are gorgeous! Love this! Those lace details on the collar are just perfect! I think that dress looks so unique because of those!